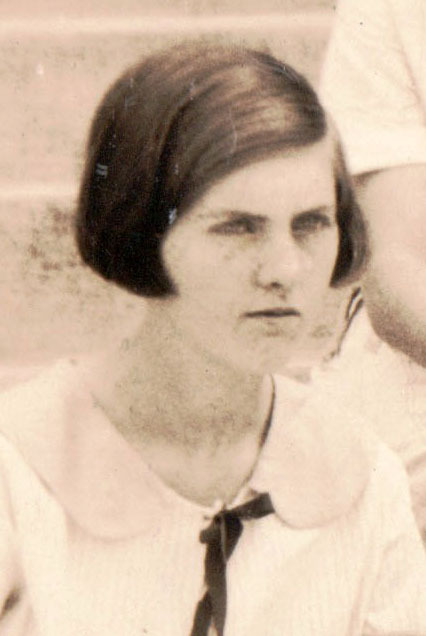 Alice James, 8th grade, April 1925. 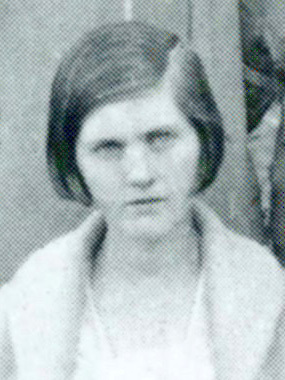 Alice Denning James, Mont Amoena sophomore, 6 May 1926. 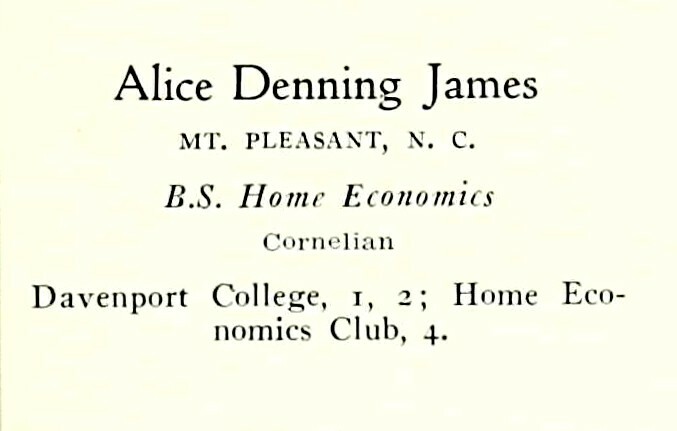 Alice Denning James, Senior at University of North Carolina Greensboro, 1932, http://www.ancestry.com. Hickory Daily Record (Hickory, NC), 18 Sep 1994. Alice James Crews, 83, of Hickory, died Sept. 16, 1994 at Catawba Memorial Hospital following a brief illness. Born Nov. 30, 1910 in Cabarrus County, she was a daughter of the late Augustus and Bessie Misenheimer James. 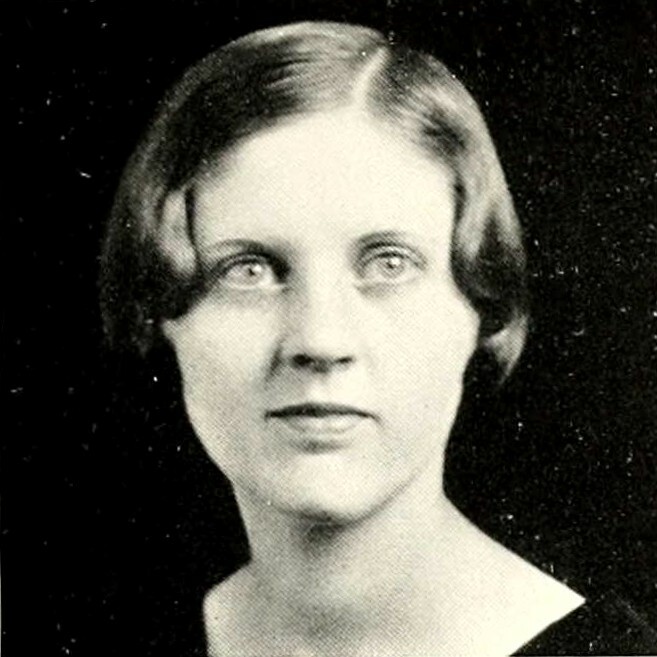 A member of First Methodist Church, she belonged to the Wesley Bible Class and the Woman’s Society of her church. A graduate of Davenport Jr. College and the North Carolina College for Women in Greensboro, she was a retired food service supervisor of Catawba Memorial Hospital. She was a charter member of Quest Book Club and the Hickory Women’s Club. In addition to her parents, she was preceded in death by her husband, Fred W. Crews. Survivors include a son, James W. Crews of Hickory; a daughter, Nancy Crews Kinney of Hickory; two sisters, Mrs. Robert Sims of Norwood and Ruth James of Charlotte; two grandsons, James W. Crews Jr. of Hickory and Andy D. Crews of Newport; two granddaughters, Gina Belk Davis of Asheville and Nancy Denning Belk of Hickory, and two great-grandchildren. The funeral will be conducted by Dr. John Cristy and the Rev. Danny Leonard at 11 a.m. Monday at First United Methodist Church. Burial will be in Oakwood Cemetery. Pallbearers will be Ray Burris, Alan Reese, Bill Young, Adam Kinney, Chris Daivs and Morgan Anderson. The family will be at the residence of James Crews, Fifth Ave. NW from 7 to 8:30 tonight. Memorials may be made to First United Methodist Church, 311 Third Ave. NW, Hickory, NC 28601. Bass-Smith Funeral Home is in charge of arrangements.